The ‘shoulder roll’, also known as the ‘philly shell’ is an old defensive technique that uses one of your shoulders to deflect punches and the other arm to block and counter. It has been made popular by skilful fighters such as James Toney, Bernard Hopkins, Floyd Mayweather Jr and much more recently, Adrien Broner. To pull it off, you need to know exactly what to do and when to do it, which requires good timing and reflexes, and also a lot of practice. This is no easy feat, but I will break it down for you from an orthodox stance point of view so that you can implement it into your boxing. If you want to learn some other advanced boxing techniques, I highly recommend the Advanced Boxing Workshop course. The shoulder roll consists of using subtle movements to deflect, block, parry and slip punches. Since it’s all based on your upper body movement with the exception of bending your knees, you can remain in a stationary position while performing it which saves a lot of energy as opposed to using your footwork to get in and out of range. Every time you make your opponent miss by using the shoulder roll, you’ll always be in a position to counter-punch (assuming that you’ve done it right). You can easily and quickly switch from defense to offense. James Toney is an excellent example of a fighter who does this effectively. The shoulder roll frustrates opponents because of their inability to penetrate the guard. They end up missing many punches or not landing them cleanly enough to do any real damage. Body punches are also ineffective because one arm is used to cover your mid-section. Unless you’re a southpaw yourself, it’ll be difficult to use the shoulder roll against a southpaw. The main punch that will be hard to avoid is the straight left (left cross) because it’s coming from a different angle. The best way to avoid it from the shoulder roll stance is to duck it. You’ll find that many times, a boxer who uses the shoulder roll a lot gets into a defensive shell. This often leads to their opponent outworking and sometimes even overwhelming them with punches. The point is that you must throw counters and set up punches consistently. From the stationary stance, you can lean back slightly to deflect your opponent’s overhand right or straight right with your left shoulder. You must remember not to lean back too much when you’re in the shoulder roll stance as you’ll be out of position and off balance when your opponents comes at you. Rotate your left shoulder and lean back slightly to deflect your opponent’s right hand and then rotate the other direction while at the same time raising your right arm (which should be held high covering your chin) to block and roll the left hook. If you’re backed onto the ropes, you can still roll and block punches, and also lean back to dodge a punch. You may decide to slip certain punches mainly hooks to the head, and especially the straight left from a southpaw. To do this, you must bend your knees slightly and bend forward at the waist. Using your right hand, you can parry jabs. Don’t try to parry hooks, overhands or straight punches because the force may cause your own glove to hit your face, or even worse, damage your hand. The jab is thrown from the waist and always make sure that it’s quick and snappy. 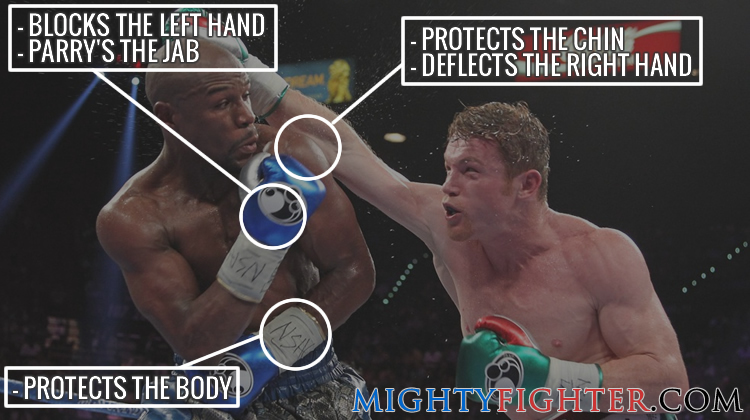 Don’t backhand your jab and always bring your jab back to its original position. The straight right plays a prominent role in your offense. Since your right hand will already be up protecting your chin, you can throw it quickly when you’re in range. You must make your opponent miss by deflecting their jab or right hand with your left shoulder and rotate the other direction while shooting the straight right. It’s a short counter so it will reach your opponent very quickly. The right uppercut is perhaps the most effective counter-punch from a shoulder roll. Once you’ve deflected your opponent’s right hand with your left shoulder, it will leave you in position to throw the uppercut. 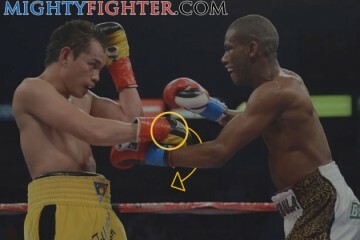 You can also counter off the jab if you time it just right. It will totally catch your opponent off guard and off balance. When you block and roll your opponent’s left hook, you’ll be in position to throw your own left hook or uppercut, and if their guard isn’t up, then they’ll be in for a surprise. No matter how good you get at doing the shoulder roll, you will get caught. But the trick is to not get caught clean and you can make sure of that by rolling with the punches. If you keep practicing you’ll find that soon enough, it’ll just come natural to you. You’ll begin to use aspects of the shoulder roll out of instinct and pure reflex.